And he said unto me, what do you see? So I said I am looking and there is a lamp stand of solid gold with a bowl on top of it and on the stand seven lamps with seven pipes to the seven lamps. 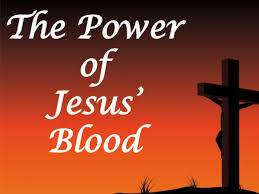 The Blood of Jesus is another tool in the armoury of the worker. The Blood has more than a dual purpose. First, it is the only instrument or heavenly liquid that cleanses us from all sins (1 John 1:7-9). Not only when we are coming to Christ as a first timer with a genuine and repentant heart, but especially also if and peradventure we fall into an act of sin (1 John 1:7-9). Second, the blood is also a great weapon of protection over our lives against the assault of our Arch-enemy, Satan and all his cohorts. The blood shields us as we engage in spiritual warfare: against forces of darkness. When we align our lives with Jesus by being born again, we automatically become an enemy to Satan. As the saying goes "a friend of my enemy is my enemy". In exodus 12:12-13 we see the power of the blood as we apply it to our lives (heart, soul and spirit), as well as everything named after us.